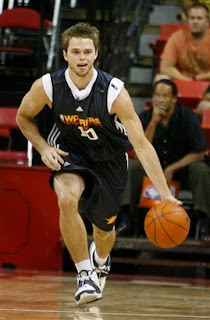 The Converse Blog: Converse in the Summer League. While this post is more about the NBA than college ball, the focus is on Converse. It seems like the whole sneaker world is waiting on Kevin Durant to make his mind up. According to reports floating around the current deals are $40 Million from Adidas and 30 Million from Nike. He likes Nike, his agent and Mother like Adidas. As a result of this elongated event only a few other players have shoe deals that are sign and announced. One of them is Mr. Oden, who signed with Nike. 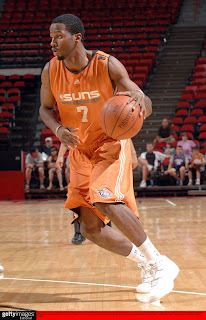 The other is Alando Tucker who signed with Converse. I fully expect once Durant picks his brand that other deals will start getting done and released to the public. That being said here are a few summer league players wearing Converse. Here Daequan Cook is wearing the Wade 1.3. Trying to earn some brownie points with Dwyane I'd say. He wore them for two games and has also wore Adidas. Seriously, Nate Funk is a pretty cool name. 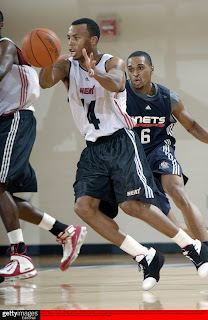 Here he is wearing the 099's in a white/navy team colorway. How great is it to finally see someone from the Celtics wearing Converse again, I sure hope the sign him up and he signs with Converse. Cons need to spend more on getting good spoken models and better commericals.